We have a range of induction loop systems for public buildings to be DDA compliant for people who are hearing impaired. Large induction loop system are suitable for churches, church halls, village halls ,law courts, masonic temples, schools, communal rooms, committee rooms, meeting rooms, residential rooms and all public buildings. A simple induction loop system is well within the capability of most electrical or electronic trained individuals. If you would like a DIY induction loop system for a church, village hall, meeting room etc it is quite straight forward providing you follow some basic guidelines. What equipment do you need to install an induction loop system? An induction loop amplifier, drum of loop cable, cable clips or tack gun, at least one radio microphone and receiver system. All systems are supplied with the appropriate interconnection cables free of charge. Below is some information that will offer you the knowledge you require to select components and install a DIY induction loop system. Typical set up of an induction loop system is to place the loop amplifier as close as possible to the sound source. 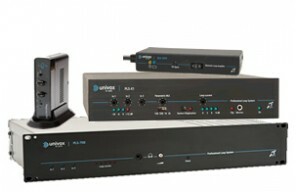 The loop amplifier can mounted on a wall closest to the sound source - for example, close to the village hall stage or near/on top of the TV in the case of a home loop. The induction loop cable is fed around the room and clipped to the skirting board or hidden under the carpet edge if present. The induction loop cable is terminated at the loop output sockets on the rear of the loop amplifier. A microphone can then be plugged into the induction loop amplifier. Audible sound reaching the microphone is converted into a small electrical signal and fed into the amplifier. The amplifier then amplifies this signal and feeds this around the room - through the loop cable as an alternating current (a.c.) signal. The bigger the room, the bigger and more powerful the amplifier needed for the job. You will need to measure the room (make measurements and calculate in m2). You can then choose the correct size induction loop amplifier to suit the room size. You need to use an amplifier than will run with some in reserve for future expansion and in any event, it is good practice to keep an induction loop amplifier loaded to a maximum of 80-95% for greater reliability. We offer a service whereby you can purchase all of the components required for an induction loop system and install the system yourself. You can arrange the installation to be done by a local qualified electrician or even volunteers. Once the system has been installed we can terminate and connect all connections, test the system, set it up to the correct level and demonstrate how the system works to all members of staff. Before contacting us for our supply and installation service have a look around your building and draw a simple sketch with measurements and details of the following. For our supply and installation service complete our Loop Estimate Form to send us the information of the room details, your contact details and some photographs of the venue. We can then send an estimate to you by you email. Induction loop amplifiers have several inputs depending on the model. This facilitates the connection of microphones, CD, iPod, radio etc. We recommend you hire our dual function induction loop test meter. This meter measures magnetic background noise and induction loop output level. Full instructions are included.